They are regarded as the leading trade fairs for the production and processing of sheet metal, aluminium and steel in Germany and Europe: Aluminium in Düsseldorf and EuroBlech in Hanover. Both fairs were last held in October. And this in each case with great encouragement. More and more international exhibitors and visitors show the global importance for these industries. The two fairs were larger and more international than ever before, despite current trade disputes, sanctions or partial bottlenecks in the supply of raw materials. 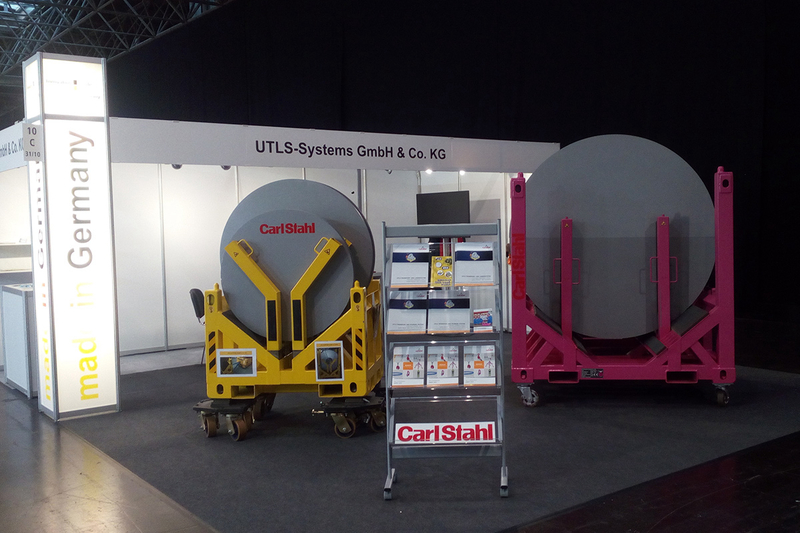 Among the numerous exhibitors was the new cooperation partner of Carl Stahl, UTLS SYSTEM GmbH & Co. KG. As a young and innovative company, UTLS was invited by the Federal Ministry of Economics and Energy to exhibit its products in a special exhibition area for sponsored start-up companies. The company presented the UTLS transport and storage rack it had developed on its 20 square metre stand. An innovative, universal logistics system for the safe transport and storage of coils, slit strips, wire coils, round blanks or round material in general. Regardless of whether it is a gear wheel, a cable drum or a slit strip. This new universal transport and load carrier system (UTLS for short) is certified by the DGUV and therefore offers a decisive advantage over in-house constructions, which are often found in-house and do not have any certification. The safe yet effective handling of coils, slit strips, wire coils and round blanks is always a challenge. Be it in operational intralogistics during the manufacturing process, further processing or transport by land, sea and rail, right through to storage. The high-quality material must not be damaged, endangered or even injured. Since there are virtually no finished and certified systems available on the market, many companies that are at home in these industries have developed their own solutions. However, these special solutions often turn out to be inefficient, unsafe, impractical and above all without suitable certification by the DGUV. This was the trigger for UTLS to develop such a standardized system. Coils, slit strips, wire coils or round blanks can now be transported and stored standing upright and absolutely safely and above all efficiently in this system directly after their production. Thanks to its sophisticated design, the UTLS system can easily be moved by cranes, forklifts or lift trucks. This makes it a real all-rounder transport system from the steel manufacturer to the end user at the machine. Multiple reloading is not necessary. Company owner Ralph Licht and his four-man trade fair team received a thoroughly positive response after both trade fair appearances: "As both trade fairs are regarded by us as system suppliers within these industries as leading trade fairs, it was more than a matter of course to be present with our own trade fair stand. Over the duration of the fair we have made numerous promising contacts, which we are now intensively pursuing." A video interview can be viewed here.